Rotties are massive, powerful, muscular, and athletic. It is to be utterly awestruck to be in the presence of a well trained Rotty. An owner must be diligent in training a Rott, sadly people haven't properly cared for this magnificent breed, often creating fear and overshadowing all the great service work they do. Rotties are self-assured, perhaps stoic in nature, with a multitude of great qualities, as they are calm, courageous, serious, steady, and confident. A dog owner can ask for no better in a loyal, and loving friend. Enjoy this wonderful show pendant in honor of this most magnificent breed. 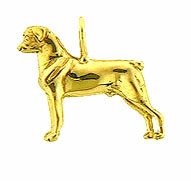 Great for a necklace, a lapel pin or a tie tack. Wear on one of our lifetime guaranteed chains or omega necklace.